Accelerated Weight Loss:WBV stimulates all cells in your body to function at a higher rate, which in turn increases your metabolism causing more fuel to burn; therefore, accelerating weight loss. Reduces Cellulite:WBV causes increased local circulation to all areas of your body, in turn giving visible cellulite areas a “smoother” look. Reduces Varicose Veins:WBV causes increased lymph drainage, which lowers the pressure in varicose veins so the valves of the veins can close off. Increase Energy:WBV stimulates all cells in your body, increases blood flow and oxygen intake, and stimulates metabolism to help flush out toxins for a renewed vigour. Improves Muscle Strength:WBV improves muscle strength the same way regular exercise does. Vibrations lengthen and shorten the fibers depending on the frequency. Enhances Detoxification:WBV works from the inside out - waste products are expelled at a cellular, lymphatic and excretion level. 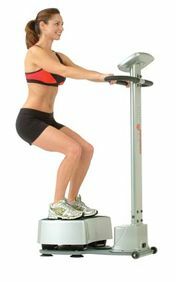 Improves Circulation:WBV improves circulation through increased blood flow by stimulating your exercise heart rate.